If appliances could talk, I imagine that clothes dryers would make the same claim as the late comedian Rodney Dangerfield – they get no respect. We take dryers for granted – overloading them with heavy jeans and towels, running them for extended hours, forgetting to clean their lint filters and ignoring signs of the need for dryer repair or maintenance. C&W Appliance Service gets a lot of calls for dryer repair when maintenance would have prevented the problem. But more important than preventing an appliance from breaking is dryer maintenance, which is a safety issue! 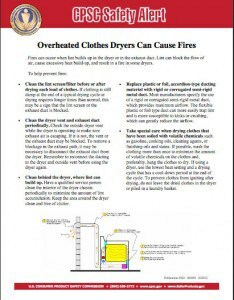 According to the U.S. Fire Administration, 2,900 home clothes dryer fires are reported each year which cause an estimated five deaths, 100 injuries and $35 million in property loss. Of those, 34 percent are caused by a failure to clean them. The U.S. Consumer Product Safety Commission (CPSC) reports that fires can occur when lint builds up in dryers or exhaust vents. It blocks the flow of air and causes heat to build up. Lint is highly flammable and can ignite with a spark. So what can you do? C&W Appliance Service hasn’t been around for 57 years by turning away business. But our customers’ safety and well-being are important to us. We suggest that you have your vents professionally checked and cleaned each year, especially if you do a lot of laundry loads with items that generate lint — like towels, robes, fleece garments and diapers. We refer our clients to Steve Bryant, a professional firefighter and owner of DryerFighter.com. He’s seen first-hand the damage and devastation caused by preventable fires. Do your clothes (especially towels and jeans) take a very long time to dry? Does your dryer get warm (or hot) to the touch while it is running? Does your dryer vent cap not open when your dryer is running? If your dryer has stopped running, then call C&W Appliance Service. The problem may have nothing to do with ventilation. It could be related to the thermostat, a thermal resistor or fuse, the start switch, the heating element, an igniter, belts, pulleys, a blower fan or wheel, or the failure of other mechanical parts. When I was a child, Mother Nature took care of drying laundry because it was hung on a clothesline. With the added convenience of gas and electric dryers, we also have dryer repair and maintenance.